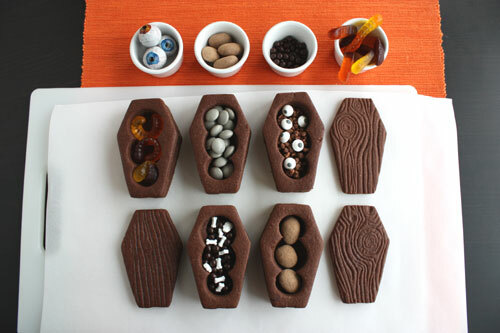 A few years ago I made Trick Or Treat Cookies for Halloween and back then I noted that I’d love to do an all-coffin version. And look! It only took me three years! 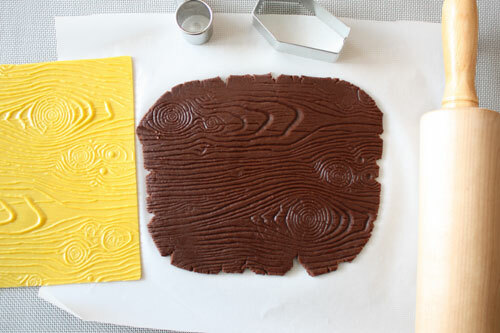 I decided to imprint the tops with wood grain using a mat meant to imprint on clay, something I first spotted on Martha Stewart (video, there with Jeff Daniels on an April Fools episode). 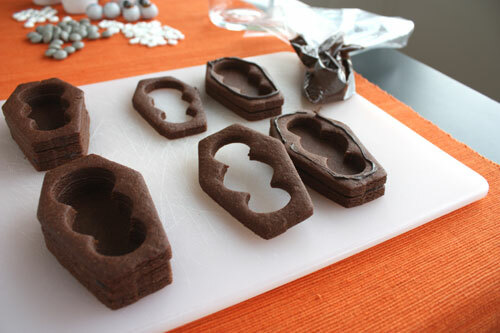 Doing a little research I found Haniela’s (video) has also created these, and her instructions are wonderful. 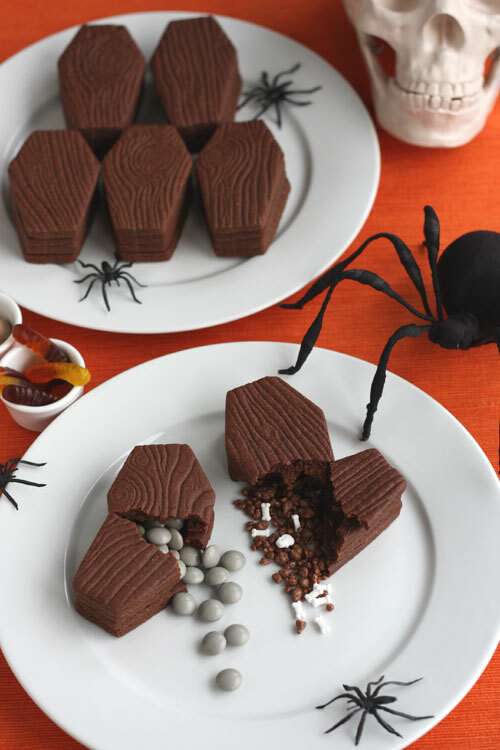 She’s got a lot of great videos for Halloween baked goods, check out this Monster Eye Cake. When you’re cutting out the cookies roll to 1/4″ thick. 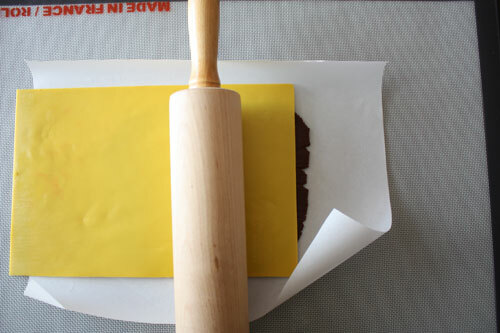 Roll the dough between two layers of parchment paper, this will keep the chocolate cookies nice and dark. I have a tiny kitchen so I roll dough on my dining room table using a medium sized Roul’pat. It’s pricey but I adore it, it grips the table and the parchment nicely so things don’t slide around, it gives me plenty of space to work on and I can roll it up to store away. 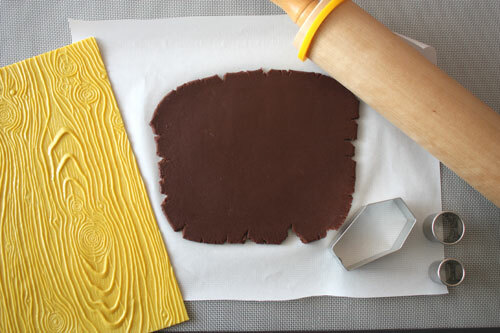 You’ll need one woodgrain top, one flat bottom and two layers of hollow sides for each cookie. 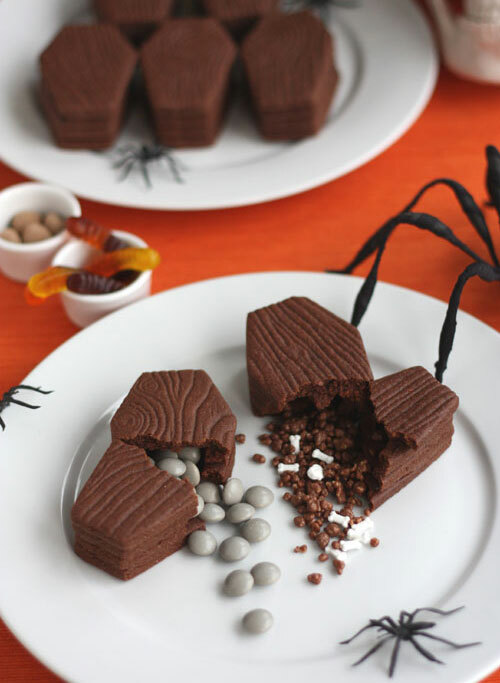 I made these with two hollow layers in the middle, instead of the single layer from my original Trick or Treat Cookies, to allow for more room for candy. I used round cutters to cut out the insides because it was far easier than trying to trim out the middles and laziness ruled that day. 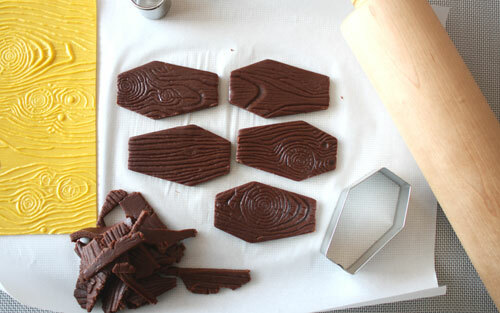 I used dark chocolate candy melts to use as glue because it sets faster, but if you have the time real chocolate would taste better. Use a plastic bag with a very small corner snipped off, no need to get out piping tips or a decorating pen for this one. 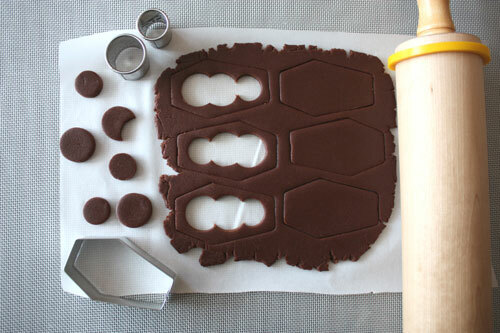 that allow you to make teeny tiny cookies. Next time I have some creating baking in mind I’m planning to head to the pottery supply store first. 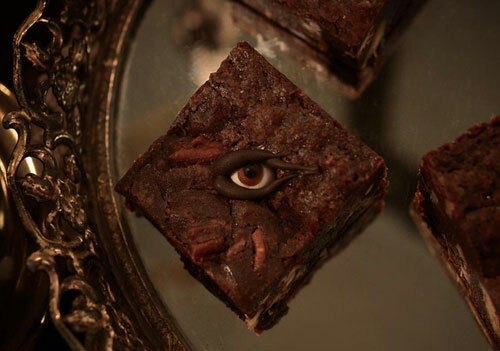 Eyeball on a brownie created by Christine McConnell. She’s made a candy eye look so much more threatening than simple sugar. Also take a look a the other treats she created. And the house she decorated. And basically everything else she’s done, it’s stunning. 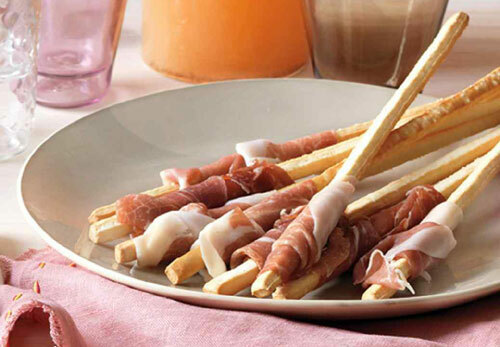 Prosciutto Wands at Martha Stewart. I first encountered these back in the summer but they instantly made me think of Halloween. Very simple and easy to interpret as ghastly when set on a darkly decorated table. 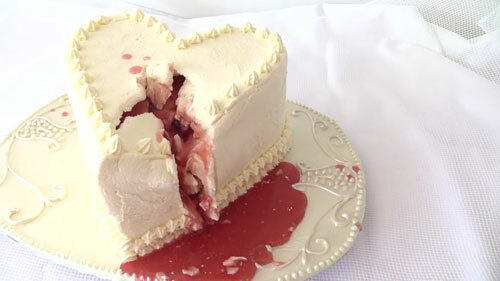 Bleeding Heart Cake (video) by Ann Reardon at How To Cook That. This is a recreation of a cake in a Taylor Swift video but this entirely edible construction for holding hidden goo until you cut into it deserves to be used for Halloween. Halloween Witch Hat Surprise Cookies at It’s Always Autumn. 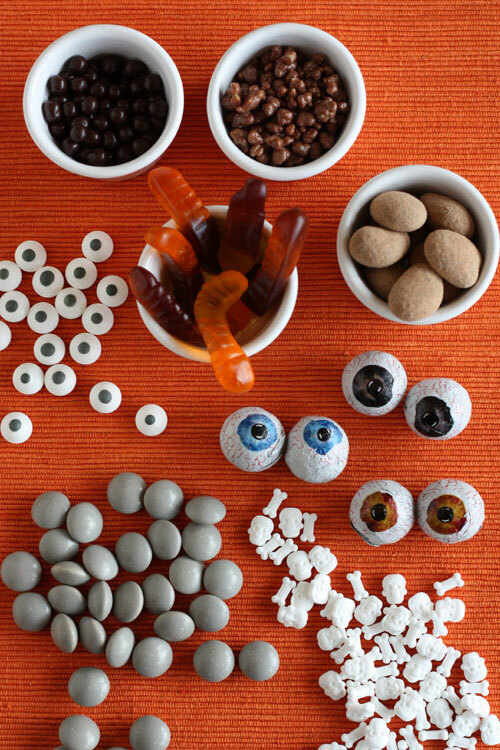 Easy to make and very cute, bonus points for mixing some candy eyes in with the other treats inside. Creepy 3D Ghost Face tutorial from PiggieLuv (video). This uses gel polish built up in layers, creepy. Via this Halloween nail art round up at Brit+Co. 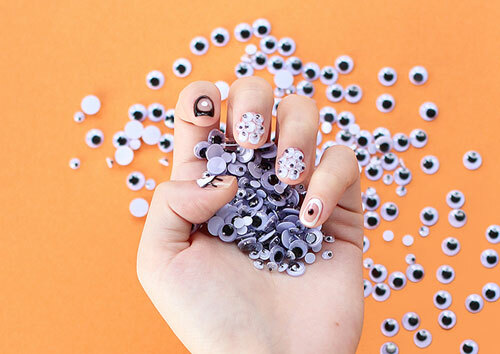 Halloween DIY Googly Eye Manicure at Design*Sponge. Silly and simple. If you’d like something even simpler take a look at the VandalEyes nail stickers at Espionage Cosmetics, both types glow in the dark! All In Your Head at the 99% Invisible podcast. They detail how the sound designer behind the television show Hannibal made sounds that make us uneasy. Caitlin Doughty of Ask A Mortician on the Explain Things To Me podcast. A great interview on how she got started in the death business, how embalming became common and what she wants done with her body when she dies. Also listen: Another interview on the Nerdette podcast. Charles Manson’s Hollywood, a twelve part series on the You Must Remember This podcast. Karina Longworth follows the series of events and the who, how and what sort of society of the time led to the Manson murders. There is meticulous research and in depth stories of the people surrounding Manson’s time in LA. It’s worth looking at the webpage for each episode to see photographs from the time. Two Halloween playlists for your party needs: at Oh Happy Day and the Marloween 2015 at The Amber Show. Has anybody tried those lace temporary tattoo masks? Do they stay on for the duration of an evening? I want to try out the various temporary tattoos that are out for Halloween (zombie bites, spiders, masks) but I’m afraid they would flake away after only an hour or so.